Go to Detroit and you will expect to see muscle cars, American classics, hot rods, the odd Lamborghini, but you will not expect to see Robert Opron’s rolling spaceship from 1970. The Citroën SM stands on the precipice of Vorsprung, it is from an era when the casual observer could believe in an eternity of progress. Men had repeatedly walked on the Moon, rock music was reaching for lofty heights and there was a passenger airplane, manufactured by an unlikely consortium of state-owned British and French firms, which could travel at twice the speed of sound. We don’t have such planes now. The Concorde was mankind’s only functioning time machine available for non-military use: you could have lunch in London, digest it aboard and continue your day—with breakfast in New York City. 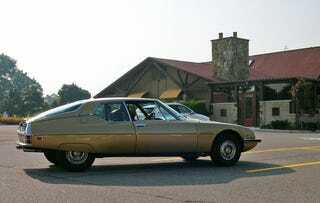 The Citroën SM was the Concorde’s contemporary, borne of a similar transnational corporate background, but it was the Italians instead of the British who partnered the French this time. The M in SM stands for Maserati, owned by Citroën at the time and responsible for the SM’s engine, but I needn’t tell you all this: google “Citroën SM” and you will find right on the first page a feature article published on this very website which will tell you all about it. You can go for years and years without seeing an SM and this is not an accident: its relentlessly futuristic engineering was marred by the combined unreliability of its French and Italian heritage. If you were to fantasize about seeing one in the wild, you would probably conjure images of French country roads or Italian mountain passes but surely not Telegraph Road in the Detroit suburb of Bloomfield Hills. Specifically the restaurant Andiamo, formerly known as the Machus Red Fox, most famous for being the place where Jimmy Hoffa was last seen alive. Yet that is exactly where Ray Wert, John Krewson and I saw a working SM for the first time in our collective lives. We were on our way back to New York City, returning from the Woodward Dream Cruise, and we stopped for breakfast at Steve's Deli across from the restaurant where Jimmy Hoffa was last seen, waving goodbye to the monster portions and trans fats of Midwestern cuisine. Just imagine: a year after the Concorde, fastest and most beautiful of Bristols, had taken to the air in defiance of kinetic heating, pressure gradients, trim changes and all the control and other problems associated with sustained flight at 60,000ft and Mach 2, the fuddies and the duddies were shaken with dismay by the very thought of the Citroën SM having fully powered steering with entirely artificial feel. It was simple, really: the basic accumulator pressure powered the steering, but pitted against it was the output of a secondary pump driven by the transmission so that its output was proportional to the road speed of the car. At parking speeds, it offered no resistance; at 110mph there was enough to cancel assitance. The SM motored away and we went inside to dive into plates of high calorie breakfasts. Outside, under an August sun not yet bearing down with its full power, the SM was spooling up its hyperdrives. This rolling projectile of weird magnificence, this golden and flawed and slippery capsule from the space age, a car ahead of its time both in design and acceptable ratios of high engineering versus reliability, it motored away.